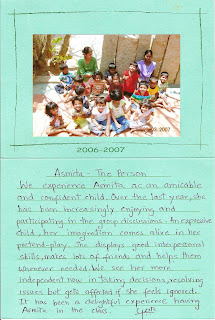 Asmita got her first “performance review” sheet after a year in her school (Prakriya). Shes had fun and is eager to go everyday and that’s what matters ! The wife and I are not going to fall for the “gotta rush to get to score 99.99%” line. If I can turn out to okay, so can my kid. Childhood should be fun. I wish a lot of people I meet can sit and enjoy the sound of silence, and see the little joys of being here.